At Corrimal Dental, we enjoy treating patients of all ages to help them achieve optimal oral health and wellbeing. This is why we also offer popular children’s dentistry services, to take care of even the littlest of smiles. Our friendly team of professionals understand the gentle, fun, and comfortable treatment that’s required when working with children and are experts at putting patients of all ages (including toddlers) at ease. 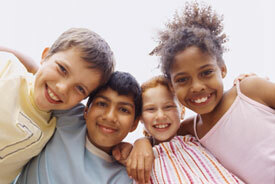 There are many benefits that come with bringing your child to the dentist from an early age. Not only does it allow your child to become familiar with our friendly team and practice environment, but they also learn to feel comfortable whilst in our dental chair receiving treatment. This also works to prevent dental anxiety and phobia from infancy, helping your child to never fear visits to the dentist. Additionally, when children attend regular dental check ups at Corrimal Dental, our oral health care professionals are able to screen their mouth, teeth, gums, and other soft tissues for potential concerns such as tooth decay, gum disease, or infections. By addressing these issues immediately, we can prevent them from becoming more complex, invasive, or expensive procedures down the track. To schedule a consultation for your child with our friendly and gentle team, please contact Corrimal Dental today. We also encourage you to ask about the Child Dental Benefit Schedule if your child is aged between 2 – 17 years, as they may be eligible.